A Piece of my Father. Jason Shulman. 2004. Though there is no God – dead is dead, dust to dust – there are ways to give someone continuity after death. You can build a pyramid, plant a rose or shoot them into space. But for me few of these address the wonder of life. 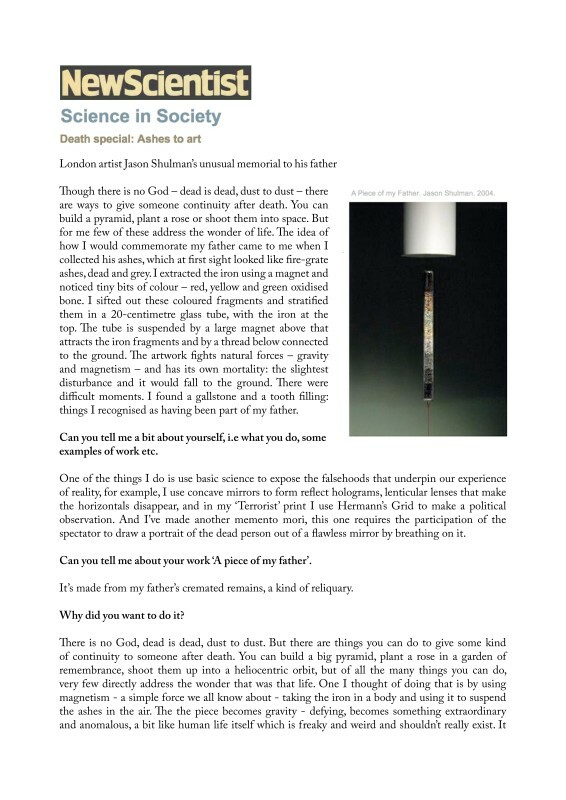 The idea of how I would commemorate my father came to me when I collected his ashes, which at first sight looked like fire-grate ashes, dead and grey. I extracted the iron using a magnet and noticed tiny bits of colour – red, yellow and green oxidised bone. I sifted out these coloured fragments and stratified them in a 20-centimetre glass tube, with the iron at the top. The tube is suspended by a large magnet above that attracts the iron fragments and by a thread below connected to the ground. The artwork fights natural forces – gravity and magnetism – and has its own mortality: the slightest disturbance and it would fall to the ground. There were difficult moments. I found a gallstone and a tooth filling: things I recognised as having been part of my father.